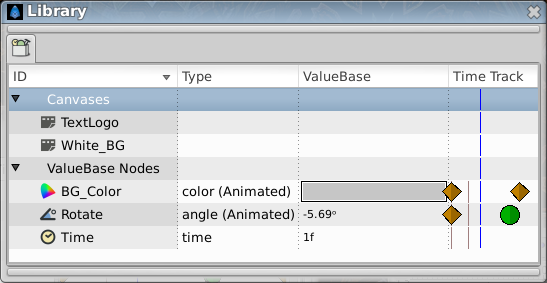 The Library panel shows all exported value nodes and all canvases in the current animation. If you find yourself using a particular color over and over again, it's a good idea to export it into the Library panel so you can easily pick the same colour in the future. Simply right-click on the color in the Parameters Panel and choose "Export" from the menu. You will be prompted for a name to associate with the value. In order to see the newly exported value in the Library panel, you will have to open up the "ValueBase Nodes" tree if it isn't already opened. The same technique works for any other parameter as well, even for complete animated spline paths. To use a value that you have exported into the Library panel in a different layer, simply select the value in the Library panel then right-click the parameter you want to apply it to in the Parameters Panel. Select "Connect" to use the value. This page was last modified on 19 April 2016, at 03:31.